Due to the increasing interest in the replacement of the environmentally toxic lube and fuel additives obtained from non-renewable raw materials by eco-friendly/biodegradable additives from renewable resources in order to meet the growing demand and to minimize the environmental impact caused by their use and disposal, this paper aims to present a short review compiling some recent efforts made to develop the eco-friendly additives through organic transformations of biomaterials. Keywords: Biomaterials, organic synthesis, lubricant, fuel, additive, environment. 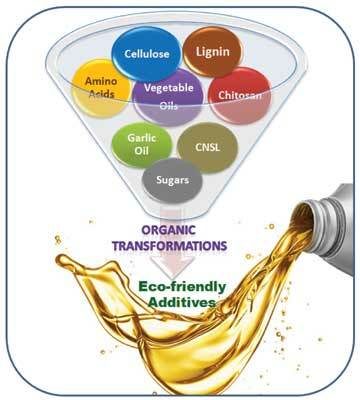 Keywords:Biomaterials, organic synthesis, lubricant, fuel, additive, environment. Abstract:Due to the increasing interest in the replacement of the environmentally toxic lube and fuel additives obtained from non-renewable raw materials by eco-friendly/biodegradable additives from renewable resources in order to meet the growing demand and to minimize the environmental impact caused by their use and disposal, this paper aims to present a short review compiling some recent efforts made to develop the eco-friendly additives through organic transformations of biomaterials.